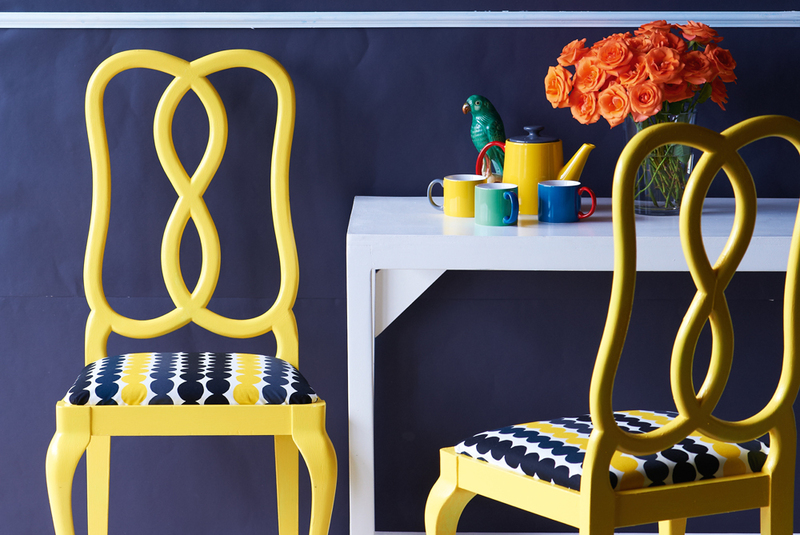 Changing the upholstery fabric isn’t the only step to updating an old chair. The makeover process starts with any changes you plan to make to the frame. You can change the chair’s finish, alter the height, and even add applied ornaments to mimic carvings. Changing the finish on a dining chair on wood-framed occasional chair gives it a fresher, newer look. Both painted and stained finishes are good options. If you like the look of the chair but the finish is too damaged to use as is, try to match the original finish as closely as you can, and make sure you color match the swatches to the chair before you strip or sand it. Changing the finish also works when you love the chair’s shape but want a drastically different look. If you strip the dark faux-cherry stain from a French-inspired bergere chair and replace it with white paint or a light wood stain, for example, paint a reproduction Chippendale dining chair with high-gloss paint that looks like lacquer to mix a formerly formal chair into a stark, contemporary space. If you’re planning to reupholster in addition to altering the finish, refinish the chair after you’ve removed the old fabric and before you attach the new. If you’re not reupholstering and the chair has a removable seat — which is called a slip seat — remove it before you work on the finish. Otherwise, cover the upholstered parts with plastic and use masking tape to affix it along the fabric lines. 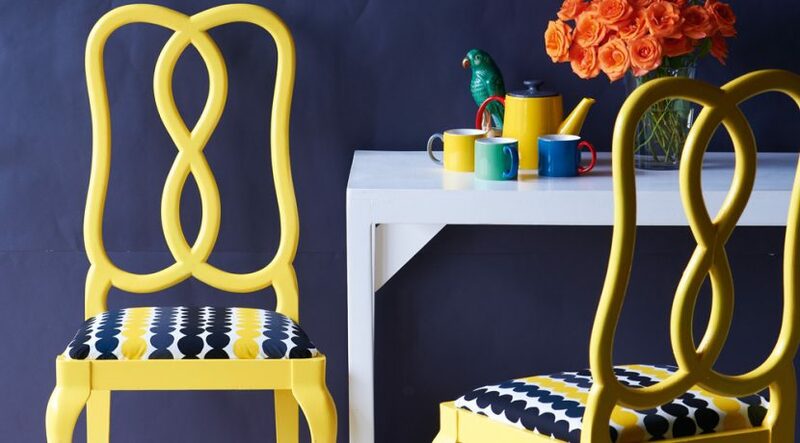 You can drastically change the look of a chair’s frame by applying flat or three-dimensional elements. If your chair has a relatively plain frame, you can affix three-dimensional appliques made of wood or composition wood to make the chair look carved. Some of the latter are even flexible when you add steam, so you can use them on curved chair frames. Apply any appliques before you change the change the chair’s finish so you can paint or stain the applique when you paint or stain the chair. Do make sure the chair’s overall style and shape suites the appliques you choose. A straight-lined slat-back chair will look ridiculous with an applied garland of roses. But, that same rose garland may look divine on a reproduction Victorian-era chair. For an artistic or eclectic look, you can use the decoupage technique to applique fabric or paper objects flat to the chair frame for a collage effect. Good options include vintage wallpaper scraps, wrapping paper, scrapbooking paper, fabric scraps, old book pages, or photos. If you opt for old family photos, make good quality copies rather than spoiling the originals. Affix them to the chair using a commercial decoupage medium, such as the popular Mod Podge. Or, make your own decoupage medium using white craft glue and water. If your chair’s legs or feet are carved or cut from the same piece of wood as the frame — such as you’d find with a dining chair or wood-framed — you can’t change them. You can frequently change the legs or feet on many fully upholstered chairs. To see if your chair legs are removable, flip the chair over. Removable feet and legs are usually screwed or bolted to the chair’s frame. Changing the legs or feet can give a chair a new feel that’s more suitable for your space. For example, switching from slender cabriole legs to square Chippendale-inspired or tapered peg legs may make your traditional wing chair look better with the rest of your clean-lined furniture. Alternatively, changing the tapered square feet to bun or spool version makes an upholstered club chair look less contemporary if you prefer a traditional interior. When choosing your replacements, opt for legs at least as thick and sturdy as the originals to preserve structural integrity. With shorter furniture feet, you can go a bit thinner and more delicate than the originals, as long as they’re the same height or shorter. In addition to structural concerns, make sure the new feet suit the chair’s overall look. If you’re happy with the way the chair feels, choose legs or feet with the same height as the originals. If you’d like to raise or lower the seat a bit, you can opt for new ones that are an inch or so taller or shorter. Structurally, going shorter isn’t usually a problem. If you opt for legs more than an inch taller than the originals, make sure the new ones will support the chair’s weight. With any leg or foot height change, make sure the chair still looks proportionate after the switch.